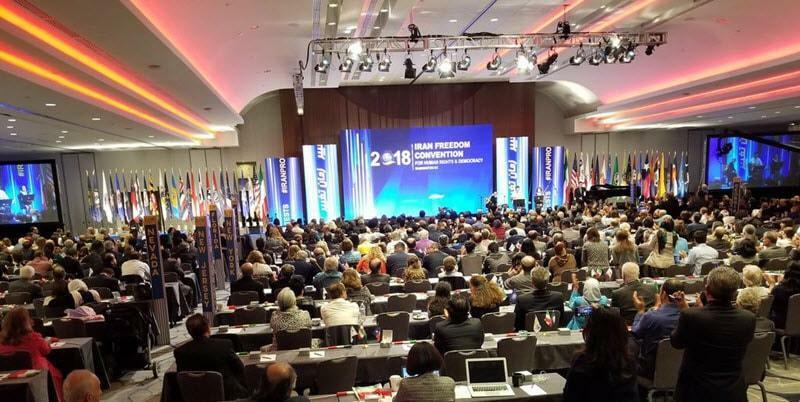 May 5, 2018 – Delegations from more than 40 US states gathered in the Iranian freedom convention in Washington D.C. which was held by the Organization of Iranian American communities in the United States. The America’s Mayor, Rudy Giuliani took the stage as keynote speaker at the Iran Freedom Convention and expressed his support for the Iranian people and called for a Free Iran, he asked US media to go to Paris and participate in the Grand Gathering of the Iranian people this summer. In a message to the Iranian American Freedom Convention in Washington DC, congresswoman Sheila Jackson Lee (D-TX) expressed support for the Free Iran and said;” Congratulations on your 2018 Iran Freedom Convention for Human Rights and Democracy! Congressman Ted Poe of Texas stated “…Your message as well as of those in Iran is a message of peace”. “You want democracy in Iran, not war or repression…”. Bill Richardson, former governor of New Mexico, a democrat took the stage and offered his support for the Regime Change in Iran, and Iranian people’s desire for a free, democratic, non-nuclear Iran which would be at peace with its neighbors. Dr. Daneshgari an Iranian American personality in his speech, described 40yrs of personal experience with the People’s Mojahedin Organization of Iran (PMOI/MEK) and stated: “I have treated their sick/injured and given them money. I can testify that they are the sincerest, most dedicated and humble human beings. They are committed to their words and sacrifice their lives for their goal”. Iranian Americans attending the 2018 Iran Freedom Convention called all freedom loving Iranians to attend at FreeIran2018 on June 30th, Paris and support a Free Iran.